From southern Oregon we headed northwest to the coast. This trip involved lots of driving, of which I did a fair amount, and that kept my nose out of a book and my eyes on the scenery. I tried to memorize the components of the lush countryside, forests thick with every kind of tree, bordered by wide bands of blackberry hedges in bloom. The Deer Brush (mentioned in my last post) in white and blue made big pastel splashes, and I’m sorry to say that a species of noxious weed, Scotch Broom, was rampant here, making gaudy yellow blotches on the hillsides in quantities I’d never seen before. I now do believe what they say: Broom is taking over. Cow parsnip bloomed everywhere, too. It wasn’t until we got to the coast and walked down to the shore that I noticed what seemed to be two types of cow parsnip. I had to wait until we got to Pippin’s house a few days later to read in her wildflower books and get the two cousins straight. They are both in the Apiaceae family, also known as the carrot or parsley family. 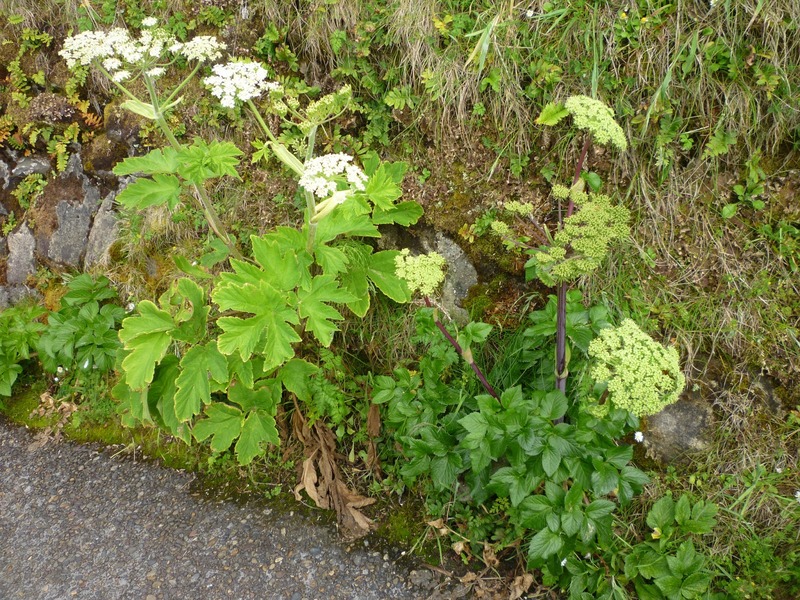 The one on the left below is the more familiar-to-me Cow Parsnip, Heracleum maximum (named after the god Hercules) and on the right is Angelica lucida, known as Sea Watch or Seacoast Angelica. That one doesn’t grow so much inland. 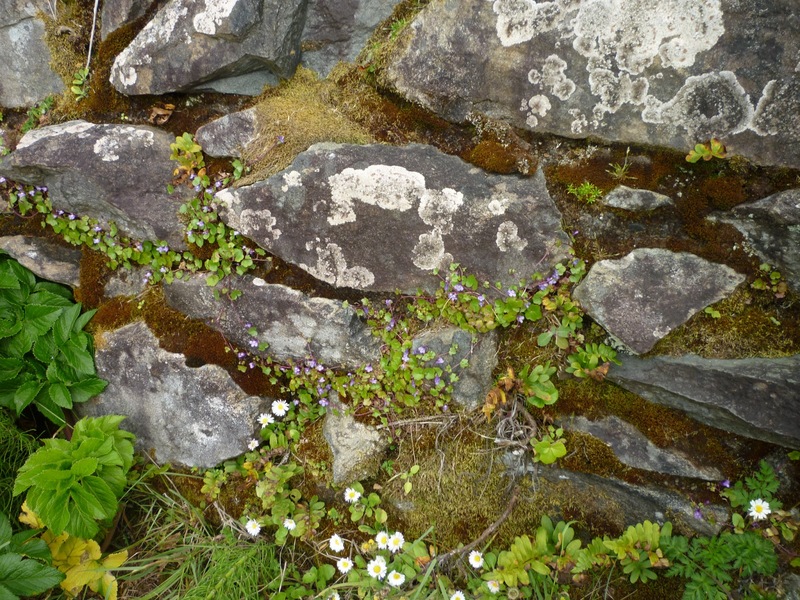 Wish I could identify the viney blue flower that grew nearby, in the middle of the photo at right, but I’ve already spent a fruitless hour trying. Anyone? 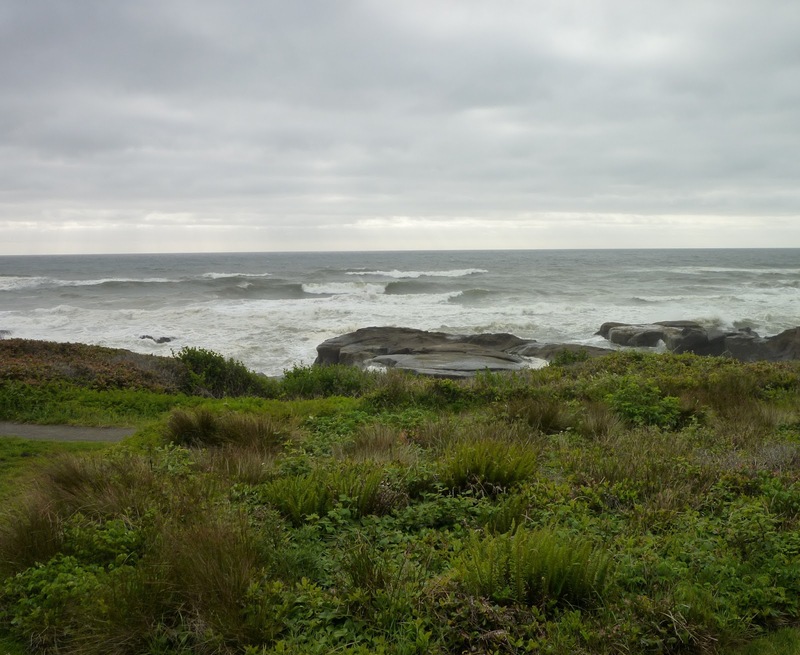 Our first night on the coast was spent in Yachats, where our room looked out on this scene. That made the long drive worth every mile – nothing like going to sleep to the sound of ocean breakers. 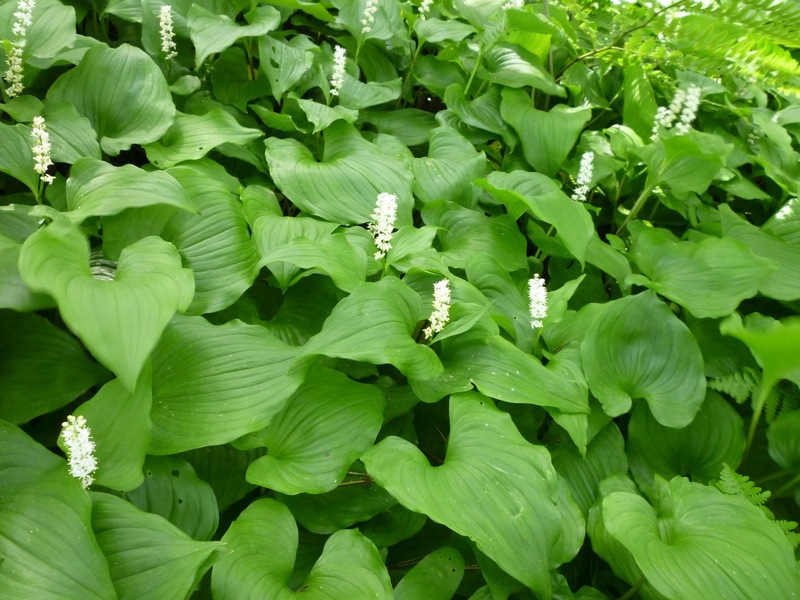 One more plant was new to me, and I eventually found it in an Oregon wildflower guide: Maianthemum dilatum, common name False Lily of the Valley or May Lily or Two-leaved Solomon’s Seal (below). Wherever we drove or walked, big rhododendrons met us around every corner, covered with big pink or red or white blooms. 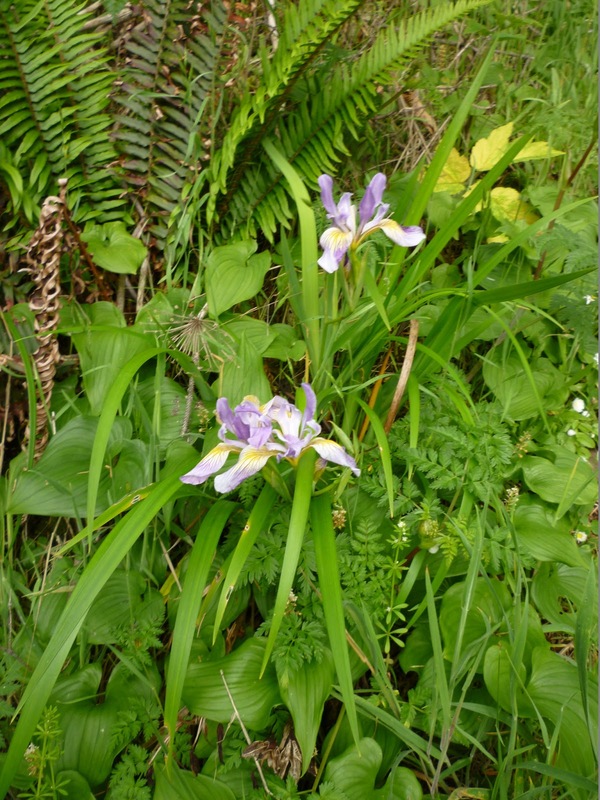 Purple vetch and foxgloves, long-stemmed white daisies blowing at the roadsides, and even giant blue lupines added to the visual feast. We did stop at the famous Oregon dunes on our way up the coast, miles of broad and high sand dunes you can get lost in. I left my shoes in the car and trudged up a tall sand hill, the wind blowing my pink flowered skirt all over. Deep sand is the most cushiony thing you could desire to hold you up, so after pausing a minute at the top to look all around, I galloped down again, feeling young and strong. Beautiful, GJ. Those photos of the ocean – how restful it looks. 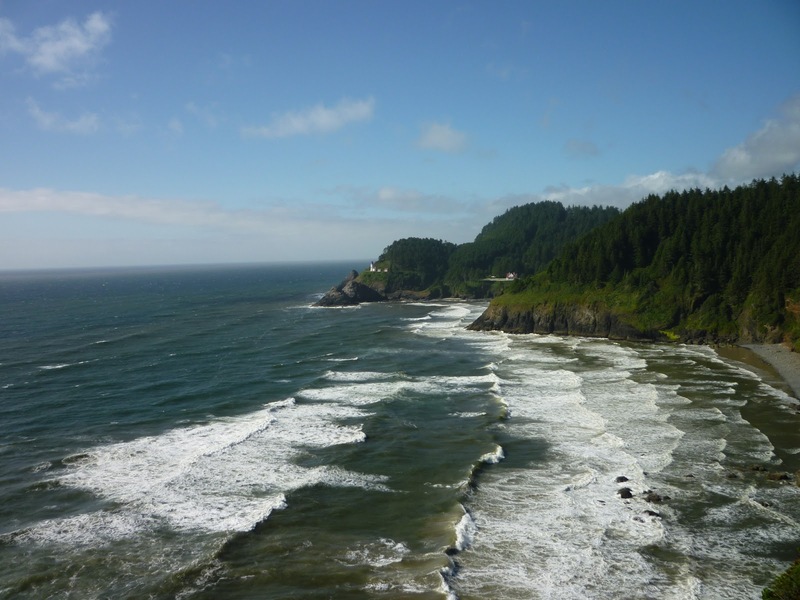 Why is something as turbulent, powerful, and loud as the ocean somehow “restful” to us? I don't know. Yay for feeling young and strong! I do like thinking about the sound of the breakers. 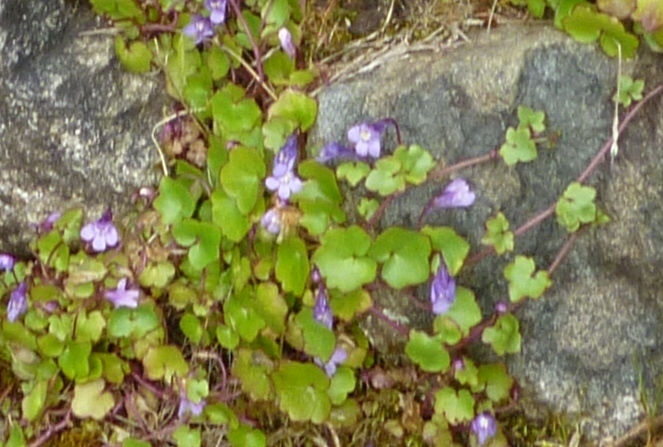 I think your blue flower is one of the Ground Ivy creeping plants. They grow all over the countryside here. Just when I start thinking, “Oh, all the foliage there is so foreign to me!” something like Solomon's Seal pops up. We have that here in NC, too, and it's such a beautiful plant. And NC is famous for its mountain rhododendron. Would love to be driving up the coast with you to see that all you're seeing! Oh, what incredible beauty! I like the mental picture of you galloping. That has got to be one of the best of feelings. Elizabeth, I so appreciate you giving me a clue about the mystery plant. I went on with that search term “ground ivy” to view many many species, but “my ivy” doesn't have such serrated leaves, and the leaves aren't opposite…the flowers do look very like, though….oh, I wish I had taken a close-up of the plant. How interesting! I was just reading a recent post by Sarah Jane Down the Lane about Queen Anne's Lace and she mentioned it is another name in North America for “wild carrot” . . .
And now, I'm off to continue reading your Oregon posts.